The CJ2A had a four cylinder L-head Go-Devil engine with an 80 inch wheelbase, and a modified and revised transmission and updated axles. Basically, the CJ2A is a modified Willys MB. Exterior changes included a hinged tailgate for easier loading and unloading and the spare wheel was relocated to the vehicles side. In addition, the headlights were replaced with larger headlights, a fuel gauge, speedometer, oil pressure gauge, water temperature gauge and the gas cap was relocated. Also, several colors were available to better market the Jeep to the civilian market. For the most part the early CJ's were designed for agricultural purposes only. A few models were fitted with fire fighting equipment. 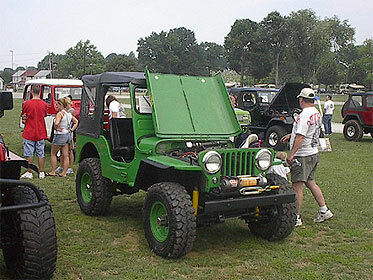 The Jeep CJ2A was manufactured until 1949 with 214,202 vehicles produced. There are many old CJ's on the road to this day. It is not uncommon to see one with a bikini top and oversized tires climbing right up a hill!